A New Map of the Eastern Parts of Asia Minor Largely taken: As Also of Syria, Armenia, Mesopotamia and c. Showing their Antient Divisions, Countries or People, Chiefe Cities, Towns, Rivers, Mountains, and c. Dedicated to His Highness William Duke of Gloucester. 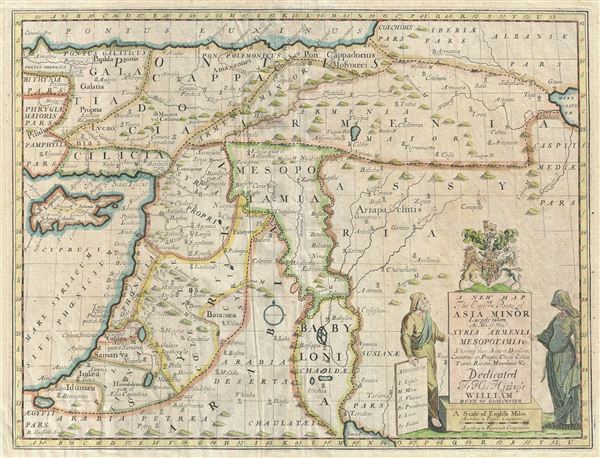 An unusual 1712 map of the Middle East in antiquity by Edward Wells of Oxford. Covers from the Black Sea to the Persian Gulf and from Cyprus to the Caspian Sea. Includes the modern day countries of Cyprus, Turkey, Syria, Lebanon, Israel, Palestine, Jordan, and Iraq. A decorative title cartouche appears in the lower right quadrant. This like many other Wells maps, is dedicated to Prince William, Duke of Gloucester and son of Queen Anne, who, when this map was being prepared, was a student at Oxford. Engraved by R. Spofforth and published by T. Bonwicke for the 1712 edition of Edward Wells' Atlas, A New Sett of Maps both of Ancient and Present Geography. Wells, E., A New Sett of Maps both of Ancient and Present Geography, (London, T. w. Bonwicke) c. 1712. Good condition. Some warping of the paper. Original centerfold. Some creasing to left of centerfold. Original pressmark visible. Blank on verso. Even overall toning. Laor, E., Map of the Holy Land: Cartobibliography of Printed Maps, 1475 - 1900, no. 833.